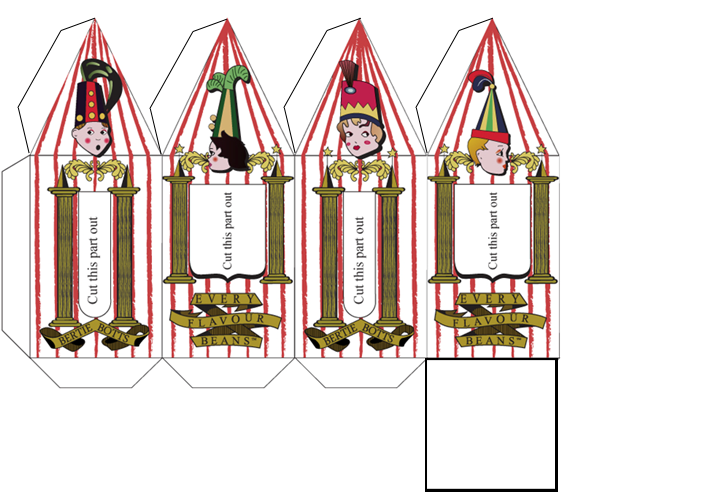 Here is a printable template of the Bertie Bott's Every Flavour Beans box for your use! 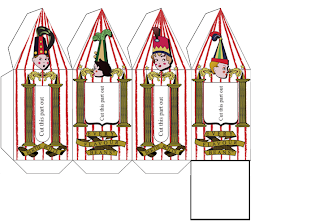 I did initially find this template on DeviantArt by 61098, however, after printing one of them out and cutting everything, I realized that there really wasn't any way to attach the triangles at the top together, nor was there an actual bottom for the boxes. So I popped it into Photoshop and gave it those essentials and voilà! The Bertie Bott's Every Flavour Beans template! Print the template out. There are two ways to do this: You can print the template on card stock paper OR you can print it on regular paper and cut out cardboard from cracker boxes, cereal boxes etc. to paste under it to give it a bit more strength. We chose to cut out cardboard as well so we wouldn't waste so much card stock. Cut out the template, including the windows. If you printed on card stock, you've got it easy. All you need to do is glue everything together EXCEPT for the bottom, because that's where you'll be inserting the beans when you're ready to 'serve' them. However, if you printed on regular paper, to make it more durable find an empty cardboard box such as those used for crackers, cereal, cake mixes etc. Trace your template onto it and cut that out. You do not need to cut the tabs out of cardboard on the bottom and sides of the template, but you DO need to cut out the bottom. Glue the paper template to the cardboard template. We did it so that the blank grey/brown side was on the INSIDE, because the patterns on the outside didn't show through the paper. Glue all the tabs together to make it into a box EXCEPT for the bottom (because you need it to put the beans in). To put the beans in them we wrapped the beans up in plastic wrap by putting the beans in the centre and then twisting all of the corners together. The corners went on the bottom of the box. Thanks so much for this, I'm going to use it as part of my Harry Potter-obsessed little cousin's birthday present! I always opened them through the bottom, however, through the top would work as well. You could glue just the bottom and middle of the triangles at the top so that the top of the box could be pulled open. Thanks a lot! This suggestion sparked some inspiration!! Somehow you could re-seal the top. Maybe cut out the re-seal bit off a sandwich bag. You know, the zip lock bags. Your a Harry potter fanatic and a crafster, would my way work? Aw, thanks :) As far as resealing with sandwich bag seals, I don't think that would work as well as hoped, however, you could glue together the three triangles and cut off the tab on one of them, then glue just the tip of it to the top of the box for easy removal with minimal damage. And if you liked, you could re-glue that section. Please can u send me all the Harry potter resipes u know by we'd cos my party is on Wednesday!! Harry potter theme and I really need potty for potter sweets!!! Ps, I love all ur sites!!!! Please help, I don't see a link for the template just the jpg image that is too small? Where's the link for the template? I was 61098 at Deviantart and Oktoberdots is my other company. My Harry Potter blog will be online september 1st and it's not more than fair that you credit me for all the hours I've put in designing this template.